Paris Gare de l'Est . . . 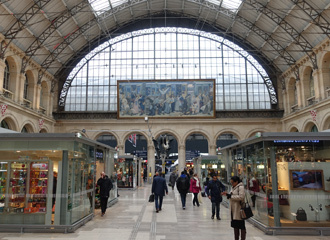 The Gare de l'Est is my favourite Paris terminal station, an elegant station that's much calmer than the hectic Gare du Nord next door, or the bustling Gare de Lyon a mile or two to the south. Opened in 1849 as the Gare de Strasbourg it was renamed the Gare de l'Est in 1854, and in 1883 it witnessed the first departure of the fabled Orient Express. It was expanded to its current size in 1931. As its name suggests, the Gare de l'Est handles trains heading east to Reims, Nancy, Metz, Strasbourg, Stuttgart, Frankfurt & Munich. It handles the weekly Paris-Moscow Express, & the weekly March-November Venice Simplon Orient Express. The Gare de l'Est is a terminus with easy, flat & level access between the taxi rank, concourse & all platforms, so painless to navigate with wheeled luggage. You can find a detailed plan of the station and its facilities at www.gares-sncf.com. Platforms are numbered 2 to 30 from left to right, starting with platform 2 on the west side. Platforms 2 to 12 are designated as the yellow platforms, most trains to & from Germany use these. Platforms 23 to 30 are designated as the blue platforms, also used by mainline trains. Platforms 13 to 22 are mainly for suburban trains. Trains are usually posted on the departure boards 15-20 minutes before departure, but the screens usually indicate whether to wait near the yellow platforms or the blue platforms before an actual number is posted, so you can wait in the right place. 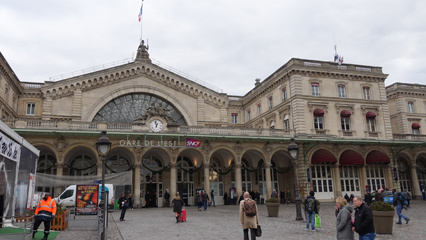 Click here for walking routes to & from the nearby Gare du Nord - I always walk via the Rue d'Alsace, but this involves steps. For level access, go via the Boulevard Magenta or the rue du Faubourg St Denis. It is a lot easier to walk than to take the metro one stop! The Gare de l'Est has a large forecourt and a broad facade with three main entrances. This is the left-hand end of that facade with the left-hand main entrance. The photo is taken looking roughly north. ...the foyer inside that entrance. The main concourse, looking east. This concourse runs the full width of the station, in the photo above the platforms & trains are immediately to the left and the shops, cafes, ticket office inside the station building and the passageways to the station forecourt are to the right. You can see the TV screens listing arrivals and departures. There is free access from the concourse onto each platform. Occasionally staff do a ticket check, but there are no gates or barriers to the mainline platforms. The Brasserie Flo, just inside the main entrance, ideal for a beer, coffee or meal while waiting for your train. It used to be the left luggage office or consigne... Currently closed for refurbishment. Take a moment to wander onto the forecourt and see the beautiful station facade. Le Cafe de l'Est has also been recommended, also directly across the road from the station, www.cafedelest.com. l'Ardoise Gourmande (www.lardoisegourmande.net) is a small, quiet and intimate French restaurant with truly excellent food by chef Gilles Ravary about 10 minutes walk away, nicely tucked away where the locals find it, but the tourist masses don't. Son Nate tried his first escargots here and decided he didn't like them, he loved them. If you don't mind the short walk from the station, this is a great place to dine. See walking directions on Google maps. 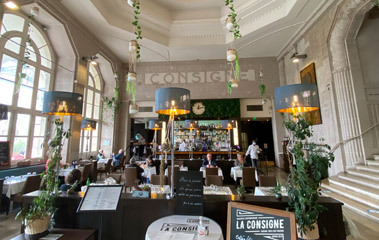 The Brasserie Flo used to the best place inside the station for a coffee, beer or meal while waiting for your train, but in 2019 it closed, either permanently or for refurbishment, it's not clear which. There are plenty of kiosks around the station selling drinks, snacks, baguettes. There is an Marks & Spencer food hall inside the station in the main building. Alternatively, there's a Monop supermarket just across the road from the station forecourt and slightly to the right, useful for buying provisions for your journey at regular high street (rather than station) prices - I have marked it on the station plan above with a red trolley symbol. There's an SNCF Grand Voyageur first class lounge but this is only accessible to holders of SNCF's (or other Railteam members) frequent traveller loyalty card which you probably don't have, or a full-price 1st class Pro fare so is useless for most visitors even if you have a (non-Pro) 1st class ticket. The station has luggage lockers if you want to leave your bags for a few hours or a day, see the luggage lockers page for details. There's a well-organised taxi rank on the station forecourt in front of the station. Even if the queue looks long, it moves fast and it won't take much more than 10 minutes to get into a taxi. Metro... See the Crossing Paris by metro page for metro advice. If you need to stop overnight, suggested hotels near Paris Gare de l'Est with good reviews include the Libertel Gare de l'Est Français (opposite the station, 3-star); Libertel Gare du Nord Suede (350m from the Gare de l'Est, 2-star). Comfort Hotel Gare de l'Est (2-star). For more detailed information on the station & its facilities see the official SNCF site www.gares-sncf.com. You'll also find a detailed station plan there.